Opening match of the Guinness 6 Nations, France v Wales. View this in the comfort of the “Blue Room” at Cwmdu Inn. Bar opens at 7:00 p.m., programme starts at 7:25 p.m. ant the match kicks off at 8:00 p.m.
Coach Warren Gatland’s last 6 Nations, will he start tonight on the road to his fourth 6 Nations Title? Please note that the monthly “Folk Night” will be taking place as usual downstairs,. Hi, thanks for checking. Everything going ahead as planned. 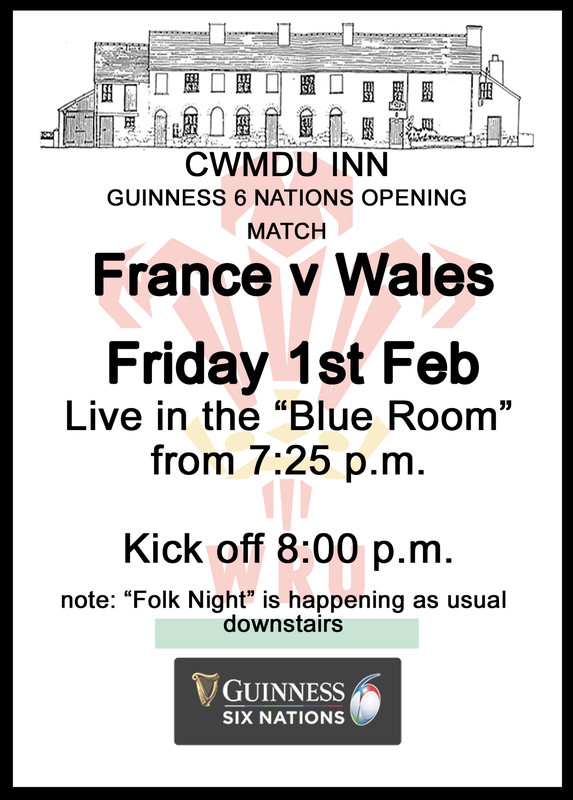 6 Nations France v Wales on T.V. upstairs and Folk Night downstairs. Bright sunshine here at moment but gritters have been seen out nearby.